A baby shares the love and attention that he gets from his family. From the moment the doorbell rings to bring in baby's Auntie, Uncle, Nannie, Gran-Gran, and cousins, lots of hugs and kisses, ooohing and aaahing, keep baby happy and loved. Wait until you see the eating, singing, and dancing until baby goes to sleep! 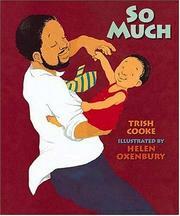 Cooke, Trish, “So much,” Children's Picture Book Database at Miami University, accessed April 21, 2019, https://dlp.lib.miamioh.edu/picturebook/items/show/7630.